You're invited to join New York's community of notable Yale alumni for an unforgettable evening of merriment, food, and drink to support a worthy cause at the gorgeous Tribeca loft of designer Anne Nakaoka Moss '77. Mix and mingle with fellow alumni who support the New York community. Enjoy an open bar of wine and selected cocktails, as well as delectable cuisine catered by Landmarc Restaurant's renowned chef Marc Murphy. All Yalies and family/friends/guests are welcome to attend this special event. We have sold over 150 tickets so far! Tickets will also be available at the door: please bring $50 cash or check payable to "YAAMNY". All Yalies plus family, friends and guests are invited to attend this special event. 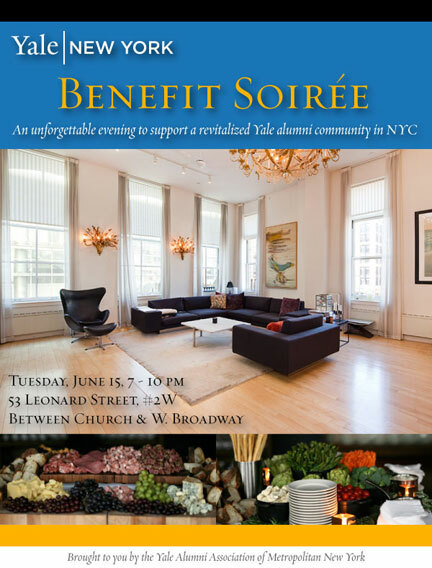 Your attendance at this special event will benefit the rejuvenated Yale Alumni Association of Metropolitan NY, a revitalized alumni community nonprofit by and for Yalies who want more out of their alumni experience in NYC. Your support will help us overhaul our technology and communications strategy, fuel our efforts for more events, and better showcase the rich tapestry of Yale activity in the city. We're here for you, and we're excited about the possibilities. Take part in our Silent Auction, with fabulous items from David Yurman, Aero Studio, Reebok Sports Club, Sephora, Avon, Smorgas Chef, Crepes du Nord, Tuniclove, CLO Intimo, Academy Floral, Paul Goldberger and Bulldog Gin!